At the beginning of the year, as cold-pressed juice became all the rage in Los Angeles, Jimmy Kimmel took to the streets to point out the absurdity of spending $10 on a glass of fruit juice. Kimmel and his team mix sugary drinks, fun dip, and even Skittles and tell people they are actually cold-pressed juice. And of course, in true Kimmel fashion, everyone buys into it. But Kimmel's segment raises a good question: Why are people spending so much money on juice if they can't tell the difference between something healthy and unhealthy? I should point out that I personally love cold-pressed juice. It's tasty and gives me a midday pick-me-up when I'm really feeling tired or recovering from a long night. In fact, this past spring, I tried using cold-pressed juice over a doctor's visit to combat a cold. And it worked! But unfortunately, cold-pressed juice is expensive and making it an everyday part of my life is next to impossible. So why do people do it? It's no secret that cooking vegetables makes them lose their nutrients, so this is the same basic concept. Cold-pressed juice is supposed to contain all of the nutrients that a regular centrifugal juicer loses. In order to avoid cooking the vegetables (the fast-spinning blade in a centrifugal juicer gets hot), most people recommend using a cold press juicer (although some experts say even a cold press juicer gets hot, too). 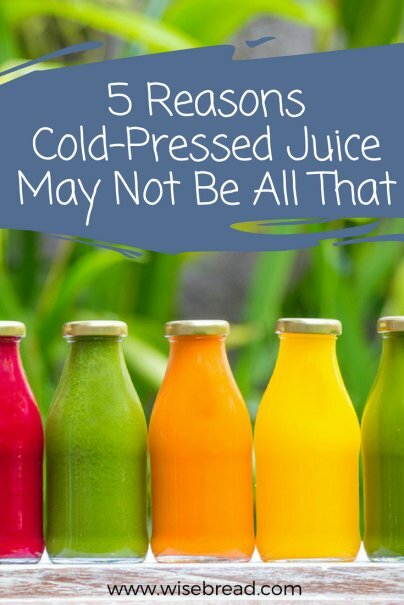 But as with all fads, cold-pressed juicing is so new that we won't be able to tell the long term effects for, well, a long time. So what do we know? Wired Magazine points out that, simply put, every gut is different. For instance, I have Crohn's disease, which means I rarely absorb nutrients unless I have the perfect balance of food in my body. Sometimes drinking juice does a number on me so I have to be careful. But no matter what, unless you pair the juices with other foods, you might not absorb the nutrients at all. You can try the Michael Pollan method to see what nutrients you absorb and when (as Wired points out), or The Plan to figure out which foods are reactive, but really just listen to your body. If you still feel tired after drinking a juice, you might not have the right bacteria or proteins in place to absorb the nutrients. Do not replace your daily fruits and vegetables intake with juicing. You should still maintain a healthy balance of fresh fruits and vegetables — try a salad every once in awhile! Now, if you're on the go, an occasional replacement is fine. Either way, a healthy diet has a variety of types of fruits and vegetables. When most people think of fruits and vegetables, they think fiber. Unfortunately with juicing, the fruits and vegetables lose their fiber almost instantly. The pulp is the part that contains the fiber and with most juicers, the pulp is stripped away. So try adding back some of the pulp or supplementing fiber with other foods such as lentils or black beans. Juicing is high in calories, but that just means you should pay attention to the labels and ask lots of questions when you purchase your juice from a juice bar (or Google a lot until you find out exactly what you're adding to your juicer). Balance your juice by adding a protein like almond milk or peanut butter. Because juice is metabolized by your body quickly, it can be dangerous for diabetics. Most fruit and vegetables are high in natural sugars, so be careful as you choose the right juice (or raw fruit or vegetable) for you. No matter what, listen to your body. If you aren't feeling well after drinking juice, don't drink it. If you feel better, drink it. As for me, I will continue to occasionally drink cold-pressed juice when I can afford it (or until a doctor tells me not to). Are you a cold-pressed juice aficionado? Tell us why!